How does (500) Days of Summer deliver as an alternative rom-com? When Tom falls in love with his work colleague, Summer, he struggles to keep their relationship together and get to grips with her casual outlook on love. The film begins with a half-serious, clever narration which works well to build up the two main characters, Tom and Summer; using this we get a quick and necessary background of both that makes their very early meeting in the film more significant and results in no additional character padding being needed. Where this film differs from other rom-coms is the gender role reversal in which the male has now becomes the hopeless and needy romantic. Joseph Gordon-Levitt brings a great tragic persona to the equation with his character Tom, and when mixed with Zooey Deschanel’s casual and noncommittal Summer, they make continually intriguing dysfunctional couple. Interestingly, Deschanel’s Summer plays the more indecisive of the two, whereby the woman is now seemingly in the role of a traditional prince charming with the male attempting to win her heart. This works really well to allow the audience to root for Tom, especially as the majority of the film centres around his opinionated conversations about Summer with his sister and friends. With such a complex mix of characters and emotions, the film is filled with some really great moments to compliment and display Tom’s feelings; whether from subtle drawings changing within a scene to Tom dancing down the street with full backing dancers, a brass band and cartoon birds, the director always finds a way to uniquely convey the mood and situation visually. These scenes usually deliver very funny and over the top moments, but always work to give a little more insight into Tom’s feelings without forcing unnecessary conversation. To compliment the great visual style, the soundtrack used is well constructed and allows certain scenes to be driven with more emotion. With an ever-changing mood throughout, the accompanying songs stand out, especially when the scenes change on a knife-edge from a happy moment in their relationship to an unhappy one. By integrating this with the characters and their obvious music tastes, it’s easy to relate each song to a particular character or situation, particularly The Smiths who both characters show great admiration for. 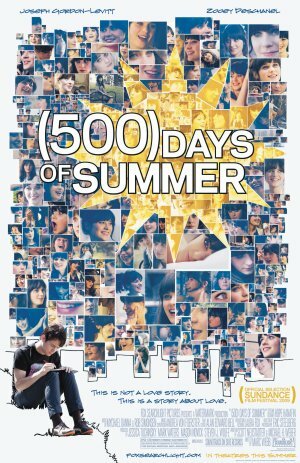 (500) Days of Summer is far away from an everyday, soppy rom-com, and this does it an immense service; it's a well-crafted, stylistically beautiful and incredibly immersive love story that never lets up or fails to convey the characters and their situation. What did you make of this as an alternative rom-com? Does the role reversal really work or does it leave you wanting more? Jump down to the comments below and let us know!